Corn acts as a support for climbing bean vines, the beans fix nitrogen in the soil for the high feeding requirements of corn and squash, and the squash provides mulch and root protection for the corn and beans! After cooperating beautifully in the garden, corn and beans form a complete protein when eaten together! How’s that for a mutually beneficial relationship? Make the best possible use of your garden space this season, and try growing the Three Sisters! Just follow the easy steps listed below, fertilize well, plant other companions like herbs to assist with pest control, and you’ll be harvesting your best crop in no time! The Iroquois believe corn, beans and squash are precious gifts from the Great Spirit, each watched over by one of three sisters spirits, called the De-o-ha-ko, or “Our Sustainers”. The planting season is marked by ceremonies to honor them, and a festival commemorates the first harvest of “green” corn on the cob. By retelling the stories and performing annual rituals, Native Americans passed down the knowledge of growing, using and preserving the Three Sisters through generations. Shape a flat-topped circular mound of soil about a foot high and 2 feet across at the top, sloping outward toward the base. Plant a circle of Corn seeds on top, about 5 or 6, and water them in well, tamping down your soil mound firmly so it doesn’t wash away in the first rain. Space the mounds 3 or 4 feet apart in the garden. Since all corn grows on sturdy, dependable stalks, the variety you choose depends on the flavor, disease resistance, and holding ability you want. Sugar Buns is a Sugar Enhanced (SE) yellow hybrid with absolutely scrumptious golden kernels and is positively scrumptious. For SE whites, you can’t beat Silver Princess, with extra-long ears bursting with flavor. And for the sweetest ears yet, you absolutely must try new Corn Mirai™, available in Yellow, White, Bicolor, and even a Mini! When your corn reaches about 5 or 6 inches high, plant Bean seeds (6 to 8 of them) around the edges of the flat top or about halfway down the sloping sides of the circular mound. Push the seeds down deep into the soil and, if you’re planting on the slope, make sure the soil is nice and firm. Add a bit of Nature’s Aid at planting time to help the Beans fix nitrogen. 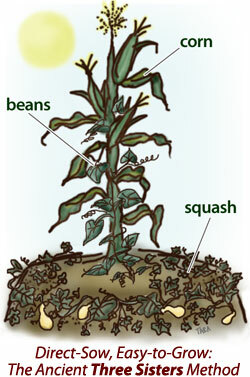 To get your Beans to climb up the cornstalks, choose Pole rather than Bush varieties. Smeraldo is far and away the best-tasting Pole Bean, with flat pods up to 10 inches long on vigorous 4- to 6-foot vines. Park gardeners rave about Kwintus, a super-early performer with succulent pods on stringless 8- to 10-inch pods. And Blue Lake is the classic name in Beans, with top-quality dark green pods that are both stringless and fiberless, even if you pick them a bit late. We even have Blue Lake available in organic seed! The traditional Squash family member for this Sister is Pumpkin, with its all-American flavor and long growing season. Rumbo is a unique Korean variety that looks like an heirloom Pumpkin but tastes sweeter and more succulent than a Butternut Squash! For a quicker harvest, grow Summer Squash varieties such as organic Park’s Early Summer Crookneck or Zucchini such as space-saving One Ball Hybrid. When everything begins growing . . . Thin the plantings to 2 or 3 Corn stalks, each with no more than 2 Bean plants winding around it. (You’ll need to help the Beans get started growing up the stalks). The Squash is going to vine along the ground, so the number of plants you need depends on how far apart your mounds of corn and beans are, how long the vines get, and how much walking space you need in the garden.